AAEA President Norris McDonald is interviewed for the Program "Science Cafe," about the pending Nuclear Renaissance. The interview was conducted by a Korean production crew on December 1, 2007. The State of Environmental Justice in America 2008 Conference at the Howard University School of Law on Friday, May 23, 2008 was a complete success. So was our forum: Environmental Justice & Nuclear Power: "Business Opportunities in the Nuclear Energy Industry." The Environmental Justice and Nuclear Power forum examined how African American businessmen and women can participate in the anticipated nuclear power plant construction renaissance. Blacks do not generally own companies that provide energy products and services, particularly in the nuclear power industry. Blacks do not own any of the energy infrastructure in the U.S. There are many reasons for this lack of participation, but one glaring reason is the very large amount of money needed to participate in an ownership capacity in the energy sector. This forum examined how companies can benefit by serving as mentors to minority entrepreneurs and investors. It also showed how minority entrepreneurs, investors and other stakeholders can be helpful in assuring the success of these huge investments. Such partnerships could bring fresh perspectives and unique opportunities to both partners. America is poised to launch a renewal of nuclear power plant construction, which will involve billions of dollars for each plant. There are huge opportunities to participate in this renaissance if minority entrepreneurs and investors are aware of the products and services needed. Of course, it would also help to have contacts in companies that will be building new plants. There are also many ancillary opportunities because of the nature of the business. These include transportation of nuclear waste by truck, rail and barge, security, construction of casks for transport of spent fuel to Yucca Mountain, electricians, physicists, metal and concrete workers, plumbers, computers, electronics, and more.The forum examined potential constraints to participation and how these problems can be overcome. Although nuclear power is not normally included as providing green jobs, the workshop clearly described how this industry will be creating such employment and how it can be leveraged to create opportunities in other areas, such as emissions trading. Finally, the forum described how these opportunities in the nuclear area can also complement new developments in conservation, efficiency, coal, carbon dioxide and transportation fuels. Technical Inquiry: Why is sanitary sewage being pumped up hill at least 200 feet high and several miles away to a pumping station when Blue Plains Sewage Treatment Plant is on a level plain about a mile away? Jurisdiction? Maryland versus DC water permitting? Usually sewer overflows are directed to outfalls at rivers instead of creeks. For instance, the Potomac River was partially 'cleaned' by directing the sewer overflows to outfalls along the Anacostia River. Thus, the overflows at WSSC’s Broad Creek Pumping Station in Fort Washington, MD are unacceptable. WSSC flows are directed to the Anacostia and Patuxent Rivers. Sanitary sewer overflows occur in all older Eastern cities every times it rains. Every time it rains the excrement from toilets in the Washington Metropolitan Area ends up going directly into the Anacostia and Potomac Rivers. It is the designed Combined Sewer Overflow (CSO) system. The same occurs in Baltimore, Philadelphia, New York and elsewhere. Sanitary pipes also run parallel to creeks and rivers in many areas to serve as backup systems when the pipes leak. WSSC is the 8th largest water and wastewater utility in the nation, serving more than 1.8 million residents in Prince George’s and Montgomery counties. They operate and maintain seven water and wastewater plants, nearly 5,500 miles of fresh water pipeline and more than 5,300 miles of sewer pipeline. In their 89-year history, WSSC has never had a drinking water quality violation. The soccer team owned by Victor MacFarlane, left, D.C. United, wants the District of Columbia to put up $225 million to build a new stadium. The District plans to consider $150 million for the stadium with D.C. United putting up any cost above that amount. AAEA supports the soccer stadium plan and has briefed MacFarlane's staff about environmental issues near the proposed project. Mayor Adrian Fenty, and Council Members Marion Barry (D-Ward 8), Vincent C. Gray (D) and Jack Evans (D-Ward 2) are leading the effort to get the stadium built. Current Chairman and CEO Rex Tillerman rejects the philosophy and effort of the Rockefeller family descendants, led by Neva R. Goodwin and Peter O'Neill, and does not believe nonfossil fuels will make a significant contribution in global energy demand until at least 2050. Today the Rockefeller family owns only 0.006 percent of ExxonMobil. Projects that generate carbon dioxide (CO2) credits under the United Nations Clean Development Mechanism (CDM) are finding it harder and impossible to get their offsets approved. If a project or retrofit leads to a reduction in carbon dioxide that would not have otherwise occurred as a natural order of business, then the U.N., through the Kyoto Protocol sanctioned CDM, allows for the selling and purchasing of credits. One example is the burning of bagasse, leftover sugarcane husks that are a renewable energy source, which the U.N. approved in the past but now considers it business as usual. Electricity generation accounts for 93% of coal consumption and use increased from 1.026 billion short tons in 2006 to 1.046 billion short tons in 2007 (a 1.95% increase compared to a 1.6% increase in electricity production). Utilities paid about $36 a short ton for delivered coal in 2007, up nearly 40% from $25.82 in 2003. The Pennsylvania, New Jersey and Maryland Interconnection (PJM) says there will be brownouts in Maryland and Virginia by 2011 if high power transmission line are not built across Loudoun County, Virginia. Of course, local NIMBY activists want to stop all transmission lines and usually say utility companies have enough power and are just trying to increase profits. Many states are facing the same problems as those in the PJM service territory, particularly New York and California. You cannot NIMBY all the time everywhere and expect electricity everywhere and all the time. Although there is a federal imminent domain law, utility companies are reluctant to utilize it because they want friendly business relationships with local and state governments. Botched half hearted deregulation of electricity only makes the situation worse as public service commissions approve rate increases that were frozen for up to a decade. Just as people are now noticing gasoline, soon they will also be 'noticing' electricity. Most people will probably throw their compact flourescent light bulbs in the trash can but broken bulbs can release a mercury containing powder that can get airborne. Mecury is a neurotoxin that can adversely affect fetuses, infants and young children. 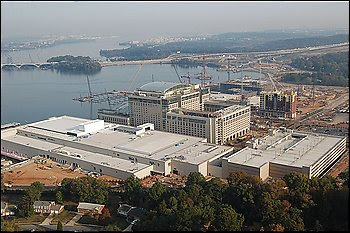 AAEA was the only environmental group in the United States to support the replacement of the Woodrow Wilson Bridge. When the replacement was proposed, NIMBYs and most other environmental groups opposed the new bridge because they believed it would create more traffic because such an amenity would 'encourage' people to drive their cars. 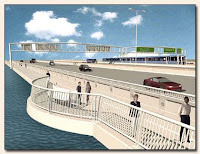 We aggressively disagreed with that assessment and led the environmental fight to get the bridge approved. AAEA presented testimony in favor of the project at the hearings for the bridge and generated positive publicity through press conferences and support rallies. Specifically, we showed that the 12-lane bridge would improve air pollution and family time by getting people to their destinations faster. We also pointed out that bridges do not 'emit' pollution. "Event organizers said the region's U.S. House delegation could not make the ceremony because of a scheduled vote, an explanation seconded by the office of Rep Frank R. Wolf (R-Va). But U.S. Rep. James P. Moran (D-Va) said he, Wolf and Rep. Tom Davis (R-Va.) boycotted the event because they felt snubbed. "Frank and Tom and I were a little bit peeved that we worked as hard as we did to get all that money and were put up in the peanut gallery, and the three people who had nothing to do with it tooted across the bridge," Moran said. He was referring to the two governors and to D.C. Mayor Adrian M. Fenty (D), who was not at the event." The event organizers are the same people who were constantly in contact with us and encouraged our support when all other environmental groups opposed the project. Yet AAEA did not receive an invitation to participate in the dedication ceremony that caused massive complaints from commuters yesterday because of rubbernecking delays. We are finding that our support is appreciated at the proposal stage of project development, but we are not included in the celebrations, recognition and other benefits after the projects are approved and built. Every time we see or cross the new bridge, we will smile at the knowledge that we played a small but significant role in its construction. AAEA will continue to do good work and support projects that we think benefit society and are environmentally friendly. 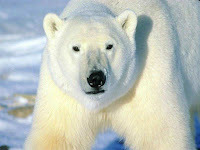 The Center for Biological Diversity, Greenpeace and the Natural Resources Defense Council petitioned to list the polar bear in 2005 and ultimately sued the Interior Department to force the regulation. A concern of the administration is that environmental groups will use the regulation to limit carbon dioxide emissions throughout society instead of waiting for global warming legislation to pass in Congress. Update: Reported after the enviro groups sued, now the state of Alaska will sue to challenge listing because they fear it will stop oil and gas development in polar bear habitat off the state's northern and northwestern coasts. Update: A week later the same green groups sued the Interior Department over the listing of the polar bear as a threatened species instead of endangered and for excluding habitat protection, which could be used to fight global warming. The May 2008 U.S. Congressional Budget Office study, "Nuclear Power's Role in Generating Electricity:"
1) assesses the commercial viability of advanced nuclear technology as a means of meeting future demand for electricity by comparing the costs of producing electricity from different sources under varying circumstances. 2) estimates the cost of producing electricity using a new generation of nuclear reactors and other base-load technologies under a variety of assumptions about prospective carbon dioxide charges, Energy Policy Act (EPAct) incentives, and future market conditions. 3) compares the cost of advanced nuclear technology with that of other major sources of base-load capacity that are available throughout the country—including both conventional and innovative fossil-fuel technologies. 4) focuses only on technologies that can be used as base-load capacity in most parts of the country, it does not address renewable energy technologies that are intermittent (such as wind and solar power) or technologies that use resources readily available only in certain areas (such as geothermal or hydroelectric power). ■ In the absence of both carbon dioxide charges and EPAct incentives, conventional fossil-fuel technologies would most likely be the least expensive source of new electricity-generating capacity. ■ Carbon dioxide charges of about $45 per metric ton would probably make nuclear generation competitive with conventional fossil-fuel technologies as a source of new capacity, even without EPAct incentives. ■ Also at roughly $45 per metric ton, carbon dioxide charges would probably make nuclear generation competitive with existing coal power plants and could lead utilities in a position to do so to build new nuclear plants that would eventually replace existing coal power plants. ■ EPAct incentives would probably make nuclear generation a competitive technology for limited additions to base-load capacity, even in the absence of carbon dioxide charges. CBO anticipates that only a few of the 30 plants currently being proposed would be built if utilities did not expect carbon dioxide charges to be imposed. ■ Uncertainties about future construction costs or natural gas prices could deter investment in nuclear power. In another report from Amory Lovins, founder and president of the Rocky Mountain Institute, he says: "Forget Nuclear"
Fannie Mae, which owns or guarantees nearly $3 trillion of mortgage-related investments, posted a loss of $2.19 ($2.57 per share) from January through March of this year. Fannie Mae is chartered by the government to keep mortgage money flowing and is responsible for about half the securities being issued to fund home mortgages. It packages mortgages into securities for sale to investors, promising to make the payments if the borrowers default. The company also buys mortgages directly. Those activities help lenders get mortgages off their books and replenish the funds needed to make more loans. The U.S. signed an agreement with Russia on May 6 to import, store and reprocess thousands of tons of spent nuclear fuel that had been supplied by the U.S. for reactors around the world. The agreement is good because it promotes nuclear fuels reprocessing. It is also good because it will reduce the risk for countries to divert that material to weapons programs. The agreement is bad because it is a poor substitute for America having its own nuclear fuels reprocessing facilities. The agreement is a complement to the Global Nuclear Energy Partnership (GNEP). Newly elected Mayor Boris Johnson, left, appointed Ray Lewis, right, a black conservative, as a Deputy Mayor for Young People, which will focus on mitigating London's increased crime rate. It was the first appointment that Boris Johnson, the Conservative Party candidate who unseated incumbent Ken Livingston of the Labor Party in the mayoral election last week. The Energy Policy Act of 2005 (H.R. 6) mandated 7.5 billion gallons of ethanol. The Energy Independence and Security Act of 2007 (H.R. 6) increased the mandate to 36 billion gallons by 2022. Although we support a mix of energy sources, we always expressed reservations about ethanol based on two primary concerns: 1) food prices and 2) increased smog (ethanol use will increase nitrogen emissions--a component of smog). There is also the water conundrum: it takes 1,700 gallons of water to produce one gallon of ethanol. But it appears that frat hedged his bets by diversifying into the ethanol biz. Perdue formed Perdue BioEnergy LLC, a new company that focuses on the growing biofuels industry. The company currently partners with biodiesel and ethanol producers to provide feedstocks and to market co-products. 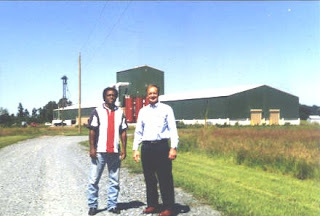 In May 2006, Perdue signed an agreement to provide corn to Northeast Biofuels LLC for an ethanol plant to be built in Fulton, New York. Yet Jim's strength is chickens and his chicken business and American food prices are being hurt by ethanol. AAEA is sponsoring a forum entitled "Environmental Justice & Nuclear Power: "Business Opportunities in the Nuclear Energy Industry," at The State of Environmental Justice in America 2008 Conference at the Howard University School of Law. The forum will examine how African American businessmen can participate in the anticipated nuclear power plant construction renaissance. The forum will bring together representatives from the nuclear power industry, entrepreneurs, and other stakeholders interested in assuring that America will have the power it needs to satisfy our society. Blacks do not own any of the energy infrastructure in the U.S. This forum will examine how companies could benefit by serving as mentors to minority entrepreneurs and investors. America is poised to launch a renewal of nuclear power plant construction, which will involve billions of dollars for each plant. There are huge opportunities to participate in this renaissance if minority entrepreneurs and investors are aware of the products and services needed. These opportunities include steel and concrete delivery, transportation of nuclear waste by truck, rail and barge, security, construction of casks for transport of spent fuel to Yucca Mountain, electricians, physicists, metal and concrete workers, plumbers, computers, electronics, and more. The forum will also examine potential constraints to participation and how these problems can be overcome. Although nuclear power is not normally included as providing green jobs, this workshop will clearly describe how this industry will be creating such employment and how it can be leveraged to create opportunities in other areas, such as emissions trading. Moderator: Ken Theobalds, Vice President of Governmental Affairs for Entergy Nuclear Northeast. Panelists: Daniel Mussatti, Senior Environmental Economist, Office of New Reactors, Nuclear Regulatory Commission. Brian Reilly, Principal Vice President and Manager, Nuclear Operations of Bechtel Power Corporation. Derrick Freeman, Senior Director of Legislative Programs, Nuclear Energy Institute. 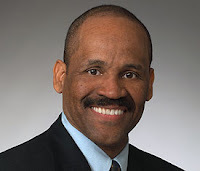 Norris McDonald, President, African American Environmentalist Association. Environmental Justice & Nuclear Power: "Business Opportunities in the Nuclear Energy Industry," The State of Environmental Justice in America 2008 Conference, Howard University School of Law, Houston Hall B, Classroom #4, Friday, May 23, 2008, 3:30 - 5:30 p.m.
Friends of the Earth Action, a national environmental group based in Washington, D.C., announced today that it is endorsing Senator Barack Obama, right, to be the nation’s next president. Friends of the Earth Action serves as Friends of the Earth's political arm, making thoughtful political endorsements, providing direct support to candidates to ensure that we have lawmakers who will work to protect the environment. Friends of the Earth Action previously endorsed John Edwards in the Democratic primary process and engaged in early state independent expenditures on his behalf. AAEA President Norris McDonald has been a friend and colleague of Brent Blackwelder for 30 years. NOW: President Obama should appoint Dr. Marsha Coleman-Adebayo as his EPA Administrator. Former Environmental Protection Agency (EPA) Administrator Wiliam 'Bill' Ruckelshaus endorsed Senater Barack Obama today. Ruckelshaus is from Indiana and hopes to influence voters in next weeks primary. Ruckelshaus became the EPA's first administrator when the agency was formed in December 1970. 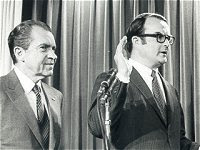 He was nominated to the position by President Richard Nixon, pictured at left, with Ruckelshaus at the swearing-in. He conducted a three-month hearing on DDT and instituted a ban on pesticide. The EPA activity and ban were came as a result of heightened fears about pesticides that was featured in Rachel Carson's Silent Spring. Unfortunately, the hysteria created by the book and EPA's action led to an international ban on its use, which could help in preventing millions of deaths in African countries suffering and dying from the malaria parasite carried in mosquitos. William Doyle Ruckelshaus served as the EPA Administrator from December 1970 to April 1973. He left EPA in 1973 to serve as Acting FBI Director, during the Nixon Administration's cabinet openings during the Watergate scandal, then served briefly as Deputy Attorney General at the Justice Department. The official birthday of EPA is December 2, 1970. AAEA President Norris McDonald was interviews on WEAA Radio 88.9 by Mario Armstrong yesterday. They discussed local, regional and national environmental issues. WEAA is a public radio station that strives to educate and enlighten Baltimore and beyond by offering programming that is culturally diverse and artistic in nature. As the leading provider of jazz, news and public affairs programming WEAA operates free from commercial influence. National news and talk are complemented by our award winning locally produced interactive content. Consistent with public radio’s core values of integrity, credibility and respect of our listeners we maintain the highest journalistic standards.